On my daughter's second birthday, she asked for “lamb on a stick”, aka rack of lamb. First of all, I was proud as punch that she asked for something so sophisticated. Clearly, I was an excellent parent — as if her favored tastes had anything to do with me! My next question was, What am I going to serve with it? This was at a time when we lived in a very urban area on the third-floor of an apartment building and we had just decided to grow all the food we possibly could on our tiny balcony. The first thing I had planted was a rosemary bush, and since rosemary accompanies lamb and other meats so well, I decided to add it to the buttery rice she loved. Thus, this very simple pilaf was born and it's been a regular staple on our dinner table ever since. We serve it at “regular” dinners, special holiday dinners, and even lunch every now and then. And yes, typically pilafs have vegetables. You're certainly welcome to add some if you so desire, but the reason I don't call for any is specifically to keep this super simple, frugal, quick, and able to accompany pretty much anything. It makes an especially lovely addition to the Thanksgiving table as well, so be sure to share it around on Pinterest, Facebook, or print it to give to friends who might be looking for Thanksgiving, Christmas, or Easter inspiration. This very simple pilaf will soon be a regular on your dinner table. Perfect for special occasions and weeknight meal, even lunch, you'll love it as much as I do. Place rice in a glass or ceramic bowl and pour water over. Stir in vinegar, then cover with a tea towel or other loose cloth and let sit for 12 to 24 hours. After soaking, drain the rice through a strainer and rinse gently. Melt butter in a heavy-bottom saucepan or Dutch oven over medium heat until it bubbles. Add shallots and cook until they’re translucent but have not browned, about 3 to 4 minutes. Add the soaked, drained rice and sauté just until the grains begin to turn golden brown, 1 to 2 minutes. Add chicken stock, salt, and the rosemary sprig, then reduce heat to medium-low and cover. Cook, covered, until all water has been absorbed and rice is tender, 15 to 25 minutes, depending on the type of rice you've used. *You can use lemon juice, whey, or other acidic medium in place of raw apple cider vinegar. **You can use either white or yellow onions in place of the shallots in the recipe, provided they’re finely diced, but if you’ve got access to inexpensive shallots, they’re definitely preferable! You may also add vegetables if you so desire, such as peas, chopped carrots, or lima beans. Add them after the shallots have caramelized but before you add the rice. 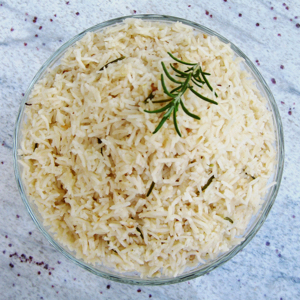 To serve, remove the sprig of rosemary (many of the leaves will likely have fallen off into the rice, which is perfect). Spoon into a serving bowl and top with a small sprig of fresh rosemary for garnish, if desired. 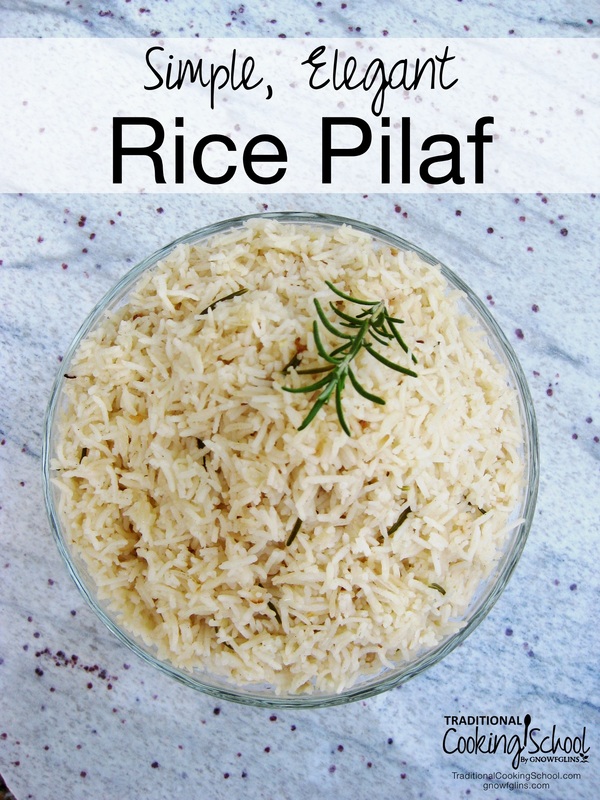 Do you love rice pilaf, like my daughter? Will you try this recipe? I started following your blog only recently. Probably a silly question…. but why do you soak the rice with vinegar? Thank you Kresha. I’m going to read the link you posted.